Easton Press is awesome. Gorgeous book. I want it. Some of you might want to compare this DLE to the edition published by Folio Society a few years ago. It was also 9x11, nicely illustrated, and translated by the late Seamus Heaney. The Old English is printed with the translation on the facing page. It was not a limited edition but was one of their finer standard editions. Now sold out, it is available on the secondary market for $100-$200. 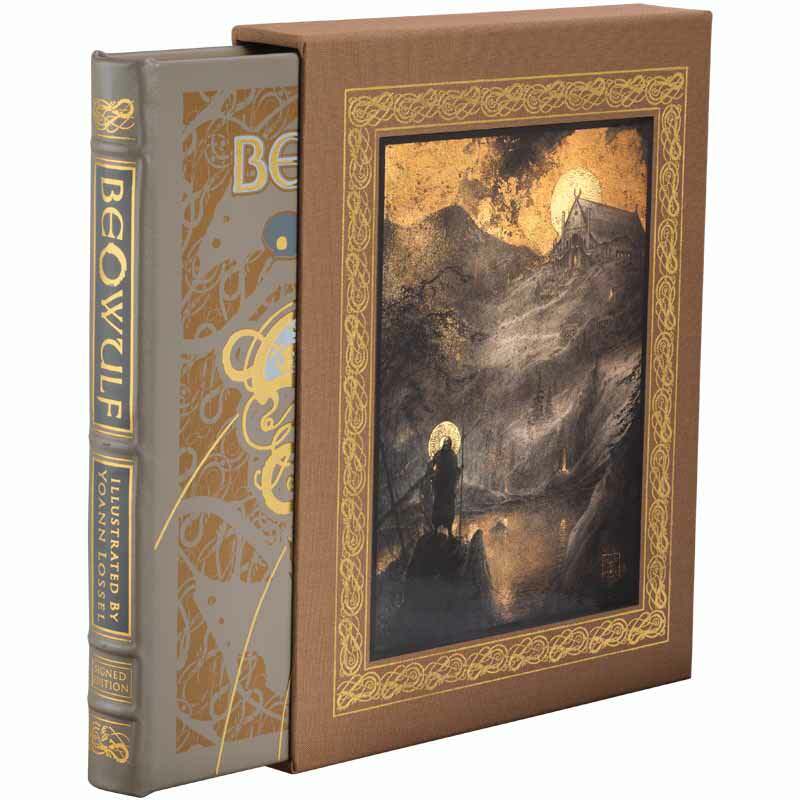 I have five copies of Beowulf of which the FS edition is probably my favorite but I'm very tempted by this offering. It reminds me of EP's Gilgamesh DLE illustrated by Rebecca Yanovskaya. If it is like the Gilgamesh DLE, it will be a treasure indeed. Sup UK? Haven’t seen you around lately! I agree I’m pretty tempted as well. Perhaps the illustrations use the gold metallic ink like in Froissarts and the DLE Antiquarian Bible??? I especially like the illustration of Patrick Rothfuss and an elf stabbing the serpent. >10 susan4stars: Get it and please show pictures. Looks like the info on the EP Beowulf has changed. They removed the pic of the signature page and now its says signed only by the artist? Ah, more false advertising. Good job EP. Pretty soon they'll be advertising gold and sending out silver. I sure sound critical here, eh. Frederick Rebsamen, the translator, is 91 years old, so perhaps he is unable to sign so many copies. I remember attending a talk by Eudora Welty when she was in her 80s. She apologized for being unable to sign books that morning because her arthritis wouldn't allow her to hold a pen. >14 jroger1: He has a nice signature, and there is no obit for him as of today, so something has happened. Hopefully they will be able to get it signed. The double signature about makes the price point look okay. Lets hope both signatures appear in the final version. I am interested in this book (Beowulf); however, when I compare it with the DLE edition of Gilgamesh, I see that both books have similar style of illustrations, both are exactly the same size (9" x 11") -- and I wonder what makes the 228-pages Beowulf more expensive at $325 than 288-pages Gilgamesh at $296. Inflation during one year? Gradual and inevitable increase of prices on Easton Press books? Or maybe there are some differences in quality. I would be very interested in hearing thoughts of our esteemed members of this forum who have purchased both books about comparable quality of leather bindings and other features between the two books. I already own Gilgamesh, and I do not think that the leather binding is very luxurious. I do like the illustrations in it. All the volumes designated as "Deluxe Illustrated Editions" are the same size with approximately the same number of illustrations, signed by the artist, probably the same kind of leather, and an attractive illustration on the front of the slipcase. Obviously, they would like us to collect the entire set. Like you, I only have two of them - "Hound" and "Gilgamesh" and am very pleased with the quality. And, like you, I am not pleased with their recent pricing. Their early editions were mostly $250-$300 and their later ones between $350 and $400 - more than I am willing to pay. Inflation cannot come close to explaining these increases (as my cost-of-living-adjusted social security checks will attest), so I can only assume the profit motive is alive and well at EP. They have been steadily increasing the prices on these, which I guess is because they have been able to sell them at the higher prices. However, given that these usually have higher print quantities, most at 1200, some of them, like Hound of the Baskervilles, have been around for quite some time. Don't get me wrong, Hound ranks as one my favorite of this series, and is very high quality and worth the price, but it was one of the earlier books in this series so the price is more reasonable. I think they are simply always trying to find the right subject and price point to keep the supply and demand ratios to maximize profit while reasonably moving inventory. They are a business, and I don't fault them for trying to stay profitable, but I do agree that at some point I can't keep up with prices and volumes and can only be very selective about what I purchase. As long as they can keep many people like me on the hook and ordering, they are happy. We have all seen where they are starting to use sales to adjust pricing on items that may not be moving as quickly as they had planned. I'm guessing production costs play a huge role. I believe, at least for the DLE, that EP does NOT raise their prices. So, if you can purchase a DLE much later, your dollar goes a bit further. And of course some DLEs have higher production values. Yeah, a better website would be appreciated, but do people remember how bad it used to be before the current incarnation?? Perhaps >20 hamletscamaro: and I haven't expressed ourselves well enough. We do not mean that EP raises the price on books already published. What we mean is that the prices of new books in the Deluxe Illustrated Edition series, which started with Hound of the Baskervilles at $267 and Dracula at $276, have steadily increased so that the latest entries in the series, MacBeth and Beowulf, are priced at $396 and $325 respectively. It is unlikely that production costs can explain such large increases when inflation has been running at 0%-2% a year. All books in the series are of similar construction with similar features and the same limitations. Has anyone received a copy of this book? "Now accepting orders. This product will be available January 31, 2018 and will ship 1-2 weeks thereafter." The Easton Press page has now been updated with real photos. Especially notice the signature page with only Lossel's signature, not the double signature as first advertised. Now also claiming to be in stock and shipping. If anybody here acquires the book, it would be nice to hear your impressions of it. Received my copy today. It is indeed signed only by the artist, in gold ink, on a tipped in title page. As shown in the current picture, the binding is grey not white. No indication of who did the binding. The leather is thin and feels cheap, I'm assuming it's the standard EP pigskin - a big disappointment for such an expensive volume. Nice paper. I like the illustrations which pretty much match what's on the website. Haven't read it yet so I can't comment on the translation. Plastic-feeling leather was my dissapointment with EP Gilgamesh edition, which also seemed to be bound in a regular EP leather. I expected that Beowulf might be using the same level of binding material, but I was hoping that it would not be the case, since the company has increased the price on the book (in comparison with the Gilgamesh). Alas, it seems that my "premonitions" were correct. >29 booksforreading:, I know we should stay away from political topics on Librarything, but I'll make this one exception. Perhaps EP should use pigs that have been active polticians. Maybe then they would have bindings with thicker skins. The artist made a YouTube video of the book. Very happy to see this! I wasn't considering this book, but may be changing my mind after viewing the video. >33 Wootle: Aside from it’s obvious beauty is Beowulf an enjoyable read even with modern translation? I see one page on the EP site, and it does not look enjoyable.